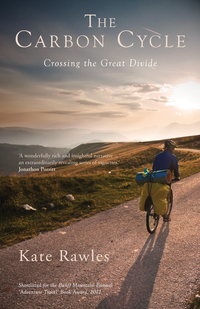 In 2006 “outdoor philosopher” Kate Rawles cycled 4553 miles from Texas to Alaska, following the spine of the Rocky Mountains as closely as possible. Cycling across unforgiving but starkly beautiful landscapes in both the United States and Canada – deserts, high mountain passes, glaciers and eventually down to the sea – she encountered bears, wolves, moose, cliff-swallows, aspens and a single, astonishing lynx. Along the way, she talked to North Americans about climate change – from truck drivers to politicians – to find out what they knew about it, whether they cared, and if they did, what they thought they could do. Kate tells the story of a trip in which she has to deal with the rigours of cycling for ten hours a day in temperatures often in excess of 100° F, fighting punctures, endless repairs and inescapable, grinding fatigue. But in recounting the physical struggle of such a journey, she also does constant battle with her own ideas and assumptions, helping us to cross the great divide between where we are on climate change and where we need to be. Can we tackle climate change while still keeping our modern Western lifestyles intact? Should we put biofuel in our camper vans and RVs? Or do we need much deeper shifts in lifestyles, values and worldviews? Kate Rawles studied philosophy at Aberdeen University and environmental philosophy at Glasgow and Colorado State. She was an indoor philosophy lecturer for nearly a decade before escaping to work freelance in 2000. Kate now works half time as a lecturer in outdoor studies at the University of Cumbria, teaching environmental issues, and half time as a freelance outdoor philosopher, writer, lecturer and campaigner. She is passionate about the need to find urgent, effective and suitably radical responses to our multiple environmental challenges (including giving our values and worldviews a thorough overhaul) – and firmly believes our quality of life can go up rather than down in the process. Kate is a keen hill walker and sea kayaker (with a particular love of remote islands with lots of wildlife) as well as a long-distance cyclist. She is a Fellow of the Royal Geographical Society and sits on the Food Ethics Council. She lives in Cumbria, United Kingdom.